Imagine a whole site dedicated to books – a programme filled with talks by your favourite authors, the biggest bookshop tent ever, deckchairs made for lounging, fresh food from all around the world…well that’s the Hay on Wye Book Festival and if you’re a book lover then you have to add it to your travel plans immediately! We visited this year after dreaming about it for decades. There always seemed to be an excuse – not enough cash, a small child, other holidays, but now that we’ve been it’s going to be a firm fixture in our family calendar. 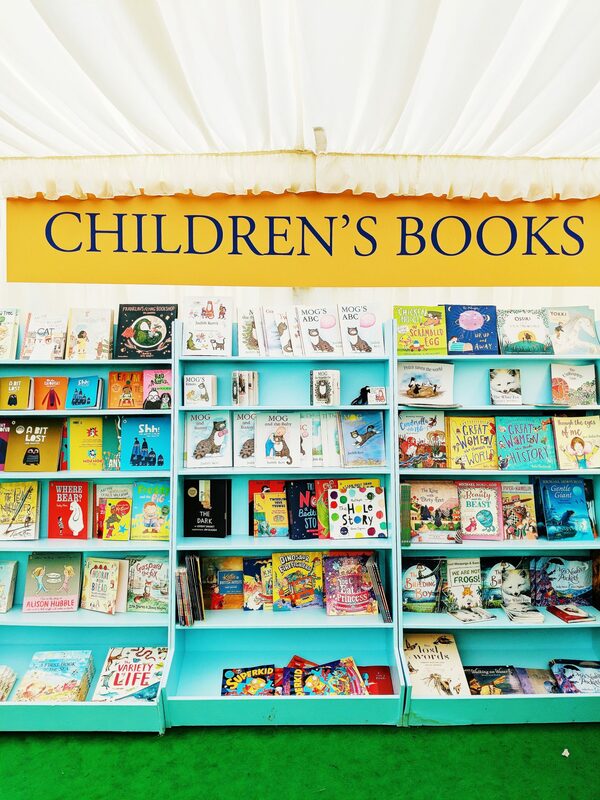 This time we only booked a few sessions over three days – Cressida Cowell, Andy Stanton, Joe Todd-Stanton and Judith Kerr – all child-orientated but fun for adults too. The loose structure also gave us a chance to work out the logistics of the event – not quite as easy as the venue can get VERY busy. 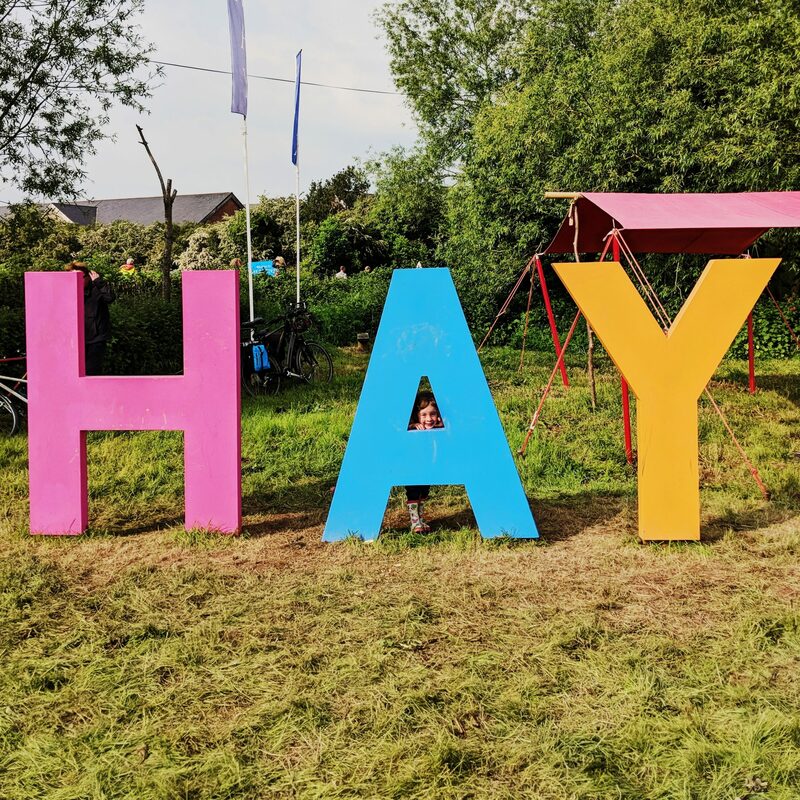 Here are my top tips for planning a visit to the Hay Festival. Book your accommodation early. Staying in Hay can be expensive so unless you are camping, it’s best to look outside of the town. We booked a weekend at the lovely Canal Boat Cottage in Crickhowell and were glad of the peaceful surroundings after the buzz of Hay. 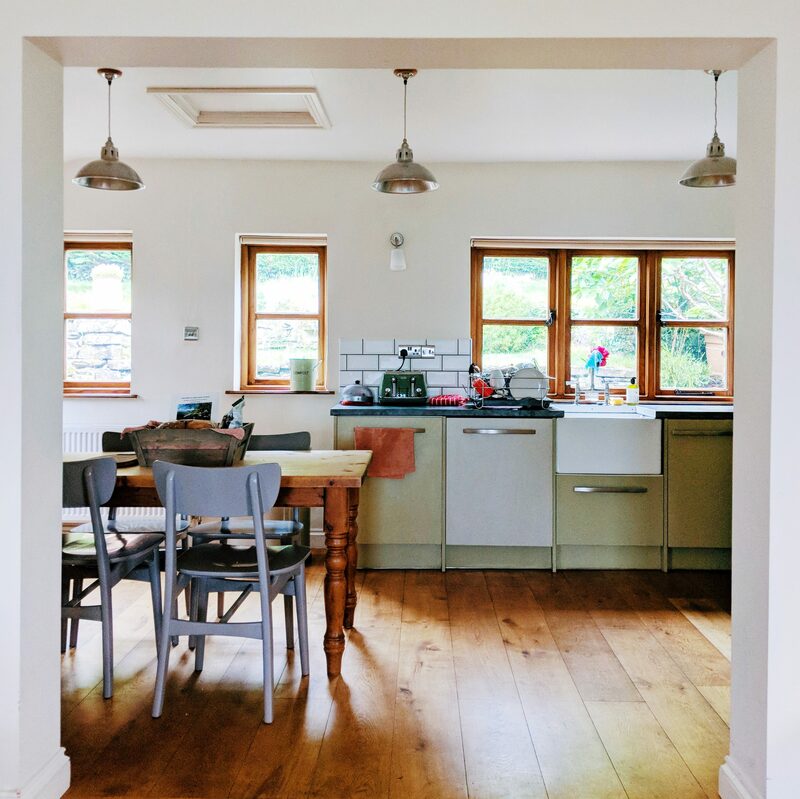 Sugar and Loaf have a whole selection of cottages on their website (2019 Hay on Wye Book Festival will run 23 May to 2 June). Alternatively you can view a range of properties on Booking.com. Join the Hay on Wye Book Festival mailing list for ticket notifications. We booked as soon as the programme was released as big names sell out very quickly. Prices average at £7 – some more, some less. If you want to get in before the crowds you can pay extra to become a Friend of Hay Festival. When packing for the festival include wellies, umbrella, sunglasses and suntan lotion. We saw all sorts of weather during our short stay. Take fold-up tote bags to minimise baggage. There’s plenty of parking in town, but we booked the parking via the Hay Festival website when we purchased tickets. It’s more expensive than other options but part of the fee is donated to Macmillan and it’s right next to the venue. The festival suggests that you arrive at least half an hour before an event, but I’d recommend getting there an hour before if you’re driving. Traffic can be slow-moving near the town and there are bag checks at the entrance. If you need to buy books for signing then visit the shop straightaway and purchase all of them in one go. The queues can be long, especially after headline talks. The signings take place in the book tent too so try to get there quickly after the author session has finished. You can buy pre-signed copies but the big names sell fast! If you have kids then there are free crafting activities available in the Make and Take and Mess tents. Our daughter is 5 and was just old enough to enjoy the experience, but I’d say that kids aged 7+ would get the most out of the programme. The food hall is fantastic with dishes ranging from pizza to paella to falafel. It’s also incredibly busy. If you decide to go, then try to avoid peak times (11.30-14.30) and find a seat beforehand – either in the tent or under one of the canopies outside then send out a foraging party! 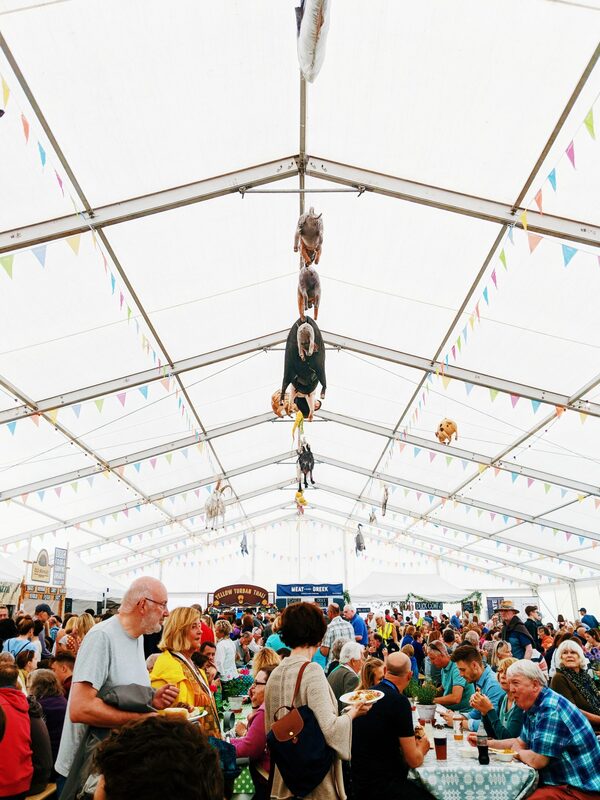 If you’re planning a visit to the Hay Festival, this is one aspect that you want to keep on top of otherwise you could be waiting a long time for food. If it’s simply too busy to order in the food hall, there are little snack shacks on the road into Hay-on-Wye. There are also water fountains on site so you can fill up bottles. You have to visit Hay-on-Wye while you’re at the festival. It has tons of fantastic bookshops and is very pretty. My favourite is Addyman Books and everyone pops into Richard Booth’s bookshop at least once. The town is a good 15 minute walk from the venue but you can catch a shuttle outside the festival entrance for £1.50 each way. We hope this will post will enhance your planning for the Hay on Wye Book Festival. We’re going again this year so will update this if there are any changes. If you found this post handy, you can see our other Literary Travel features here.